Tim Keller is one of my favorite authors. Rarely do I fail to benefit from his writings. Last year he released a book called Every Good Endeavor: Connecting Your Work to God’s Work . As usual, it was excellent, the most comprehensive and paradigm forming book on work and the Christian I have yet read. I know “paradigm forming” is high praise bordering on hyperbole, but actually mean it. It shaped the way I think about God’s design for work and a person’s calling, no matter their gifts or industry. I was glad to be able to review it for Leadership Journal a few months ago. There are no second-class Christians. We know that. We understand that God honors all vocations, not just ministry ones. It can still be a challenge, however, to help people who work outside the church see their callings as God’s work. 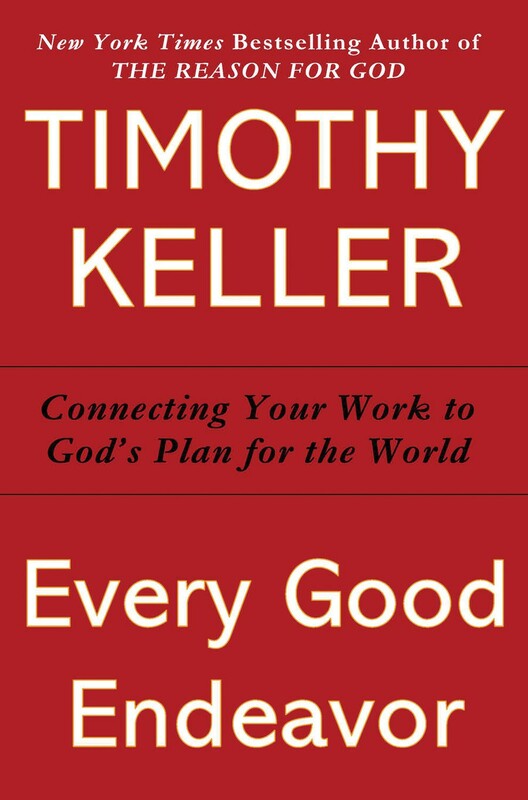 In Every Good Endeavor: Connecting Your Work to God’s Work (Dutton, 2012) Tim Keller uses his customary insight and depth to tackle the topic, explaining God’s rich intentions for work. Keller demonstrates that work was started by God when he created the universe. Keller writes that work is for the keeping of the created order, a human necessity foundational for all societal advancements. To see work this way is to empower people in their work whether they wear white or blue collars.